These young beautiful children are so full of light, happiness, love, joy, excitement, innocence and beauty. Those of you who have children in your life know how important they are and how they make us feel. As adults our job is to train them, teach them, learn from them, yet set a foundation and structure for them to excel. It is our task to lay down the foundation so that they can continue to be happy and successful in their lifetime on this earth. At SikhNet we are trying to help in this process by creating resources and services geared towards kids, in a way that children of our current age can relate to and understand. In 2010 our goal create a dedicated website geared towards our younger generation. We have many ideas, but we need your help. 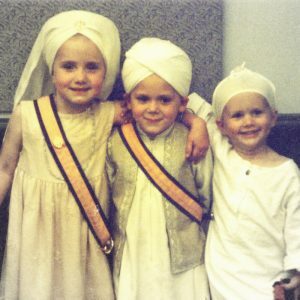 As you watch the below video please think about all the thousands of Sikh children around the world who will benefit from the services we hope to create on SikhNet. Please join in and become part of the SikhNet family of supporters and contribute whatever amount you can afford to help us reach our goal.